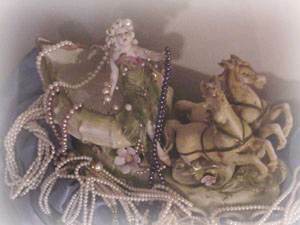 Welcome to AsianPearls.net. All of our pearl jewelry is made of cultured freshwater pearls, imported direct from the Orient. If you have any questions regarding our policies, please take a moment to read our sales information page. We hope that your online shopping experience with us will be comfortable and efficient. Holiday Special - Talk about an exotic pair - 16 inch, hand knotted, graduated, 5.0-5.6 mm round black pearl necklace with a 14K gold filled filigree safety clasp and matching 5.6 mm earrings with 14 K gold filled stems for only $60.00 packaged in an oriental silk sack. We offer a no questions asked MONEY BACK GUARANTEE plus FREE SHIPPING within the continental United States on orders over US$500. The shipping charge for all other orders to the United States is US$10 (non-refunadble). There is a $25.00 shipping charge for international orders. Lavender Jade necklace/earrings set. 17 in. 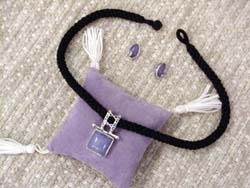 square cut lavender jade necklace with a 3/4 in. stone, and matching 1/2 in. hand inlaid oval earrings. If you don't know much about the purchasing or care of pearls we suggest that you check out our Learn About Pearls page before you order. 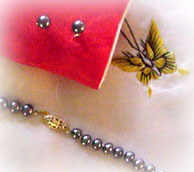 Something Extra for You - All of our pearls are shipped to you packaged in a gorgeous Asian silk sack. See the Sales Information page for a picture of the silk sacks. Security Concerns - Any information you send us will be fully encrypted for your protection. Visit our Security page for more detail. Comments - We appreciate any comments you take the time to send us and we will respond to you within 24 hours. Special Orders - if you would like to request an item or would like a custom made item let us know. We will respond to you within 24 hours.